Ah, another cheesy review of my old cartoons and comics website, Behold The Cheese. I drew most of these cartoons and comics between 2007 and 2011. The oldest ones are what I would now call Two-Minute Comics, which are scribbles in permanent marker capturing a silly idea. The latest ones (most not shown yet, saving for later entries in this series) were comics of two or more panels that were drawn all right. Today’s cartoons come from mostly 2008, except the obvious permanent marker cartoon, which comes from 2007. In the summer of 2008 I worked at an internship in Forrest Gump’s Savannah, GA, and I was drawing mostly with a Pilot V-Ball pen on printer paper. I had most Fridays off at that job, where we practiced “four tens”, or four days of ten hours each day. I spent most Fridays doodling and reading. The results are the cartoons that look like the ones below. Keep in mind that this retrospect series had not been chronological much at all. Oh wow, it’s Batman! Anyone remember Bat Boy from the Weekly World News? That’s the reference here. I think this evolution follows most of the Pokémon conventions, in that later forms get more spikes and are notably cooler. Batman also has a lot more money than Bat Boy. He buffed up quite a bit too, but so did Christian Bale in changing roles from Trevor Reznik in The Machinist to Bruce Wayne/Batman in The Dark Knight Trilogy. Speaking of which, I’m pretty sure I drew this around the time The Dark Knight was in theaters. 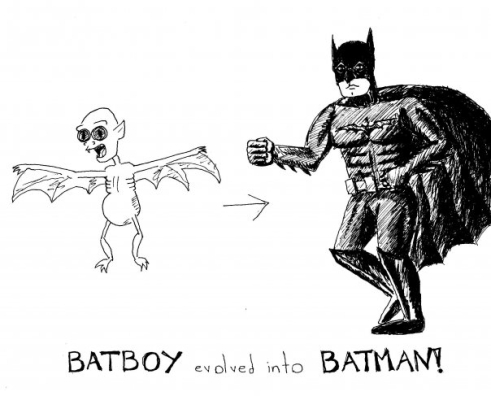 Does Bat Boy relate to Bruce Wayne in any way? Has anyone watched the TV series Gotham? Does actor David Mazouz (young Bruce Wayne) resemble Bat Boy? These are pressing questions. Someone has to know. Here we see a couple that is upset about professions. 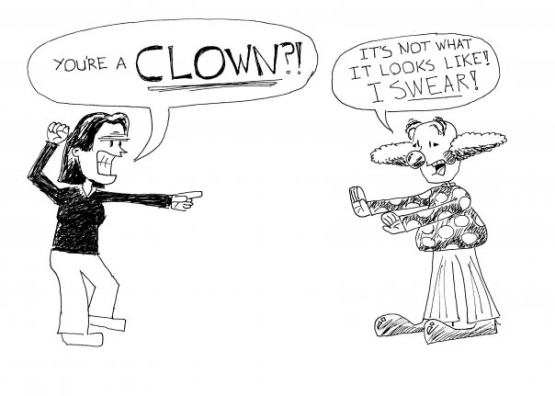 The woman is upset with the man about his being a clown, and the man is trying to deny it even though it is very obvious he is a clown. Maybe they are in some kind of relationship where keeping secrets about professions—however comical—is frowned upon. It’s unclear. I was playing around with expressive eyebrows here, having never really drawn them before. The clown eyebrows are very Peanuts, and the woman’s eyebrows are just horizontal lines (that were supposed to represent frustration). I like how the clown’s hair came out. Someone told me tonight these cartoons reminded him of The New Yorker cartoons. The single panel cartoons definitely had The New Yorker as an influence. These very literal paragraphs surrounding the cartoons have The Monkeys You Ordered as an influence, where I think the literal interpretation of something silly is even funnier than a punchline. In fact, being a fan of situational humor, I don’t really like or use punchlines. I much prefer reversals of expectation. In this next cartoon we see what happens to your batteries when they die. They hold funerals. The tears are actually some kind of magnesium dioxide solution, not saline water, so don’t get too close. You can see that I’m referencing the Duracell and Engergizer brand names here. 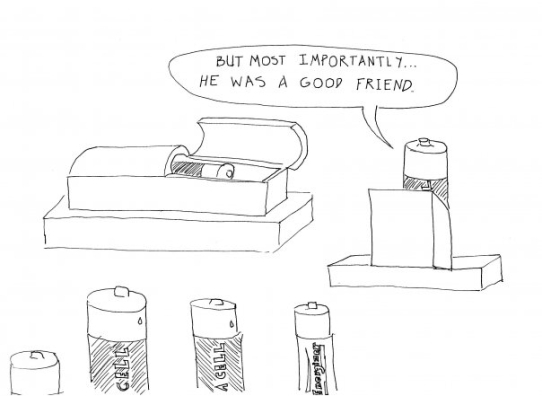 I’m glad that competing battery brands can get together and respect their dead. I got a nice comment on this cartoon when I used it as my profile picture on Facebook. A friend said, “This belongs in a newspaper.” What do you think, readers? 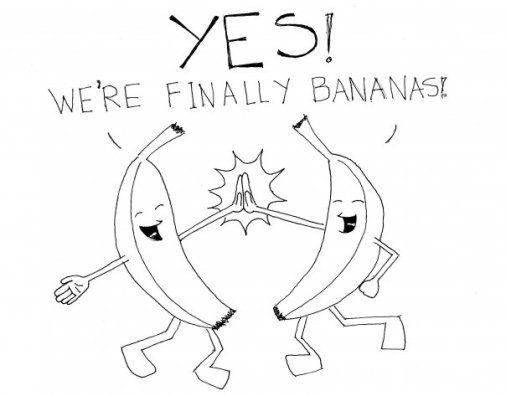 Next, we see some bananas with faces and limbs getting very excited about being bananas, probably after being something else for some duration. What did they used to be? Are they actually bananas if they have faces and limbs unlike most bananas? Is this actually just a visual play on the adjective “bananas”? If so, why would they be excited about being nuts? Does that mean they are actually nuts and not bananas? They don’t look like nuts. We covered what nuts look like in Part 6. 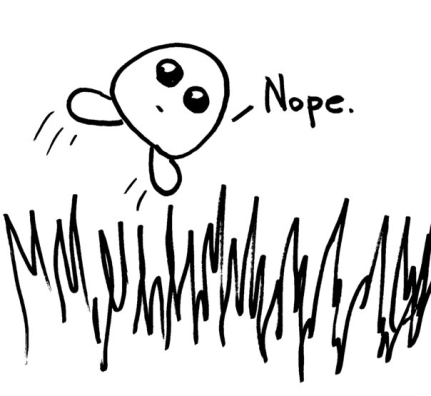 Good, here’s another Two-Minute Comic of some creature leaping up from the grass. The image file was called “nemnoo.jpg”, where a nemnoo was an imaginary creature I came up with that is mostly eyes and feet. I think the nemnoo is checking for predators by jumping up above the grass. What eats a nemnoo? Do nemnoo taste good?